STUFF your Shopping cart FULL with your favorite Chews for the LOW price of just $7.95 for Fast 2-4 day shipping via USPS PRIORITY MAIL ! Our MONSTER-WHOLE Rocky Mountain Gobstoppers are Massive Dog chews, consistantly cut from Jumbo sized Premium Quality, Grade-A+ Naturally Shed Elk antlers from 4 western US states. 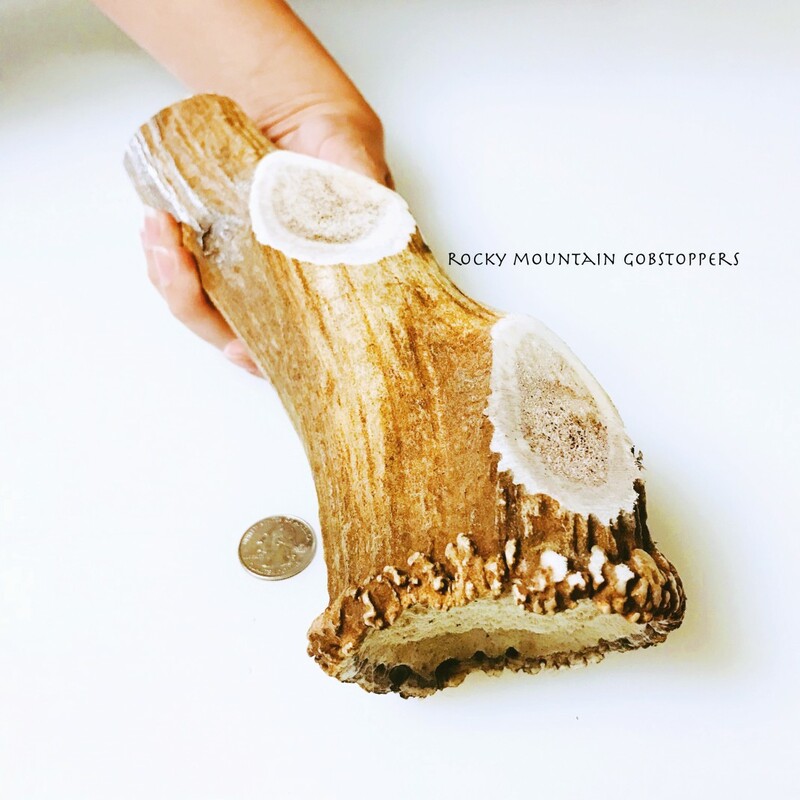 The typical MONSTER WHOLE Rocky Mountain Gobstopper Elk Antler Chew is 10-12" long and typically weighs 1.5 - 2 pounds or more! 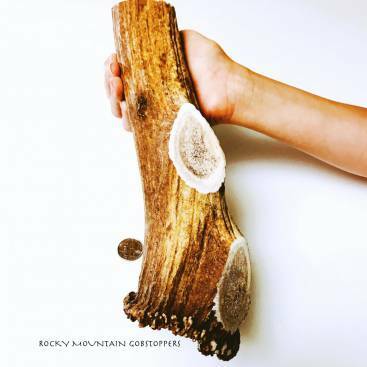 This is a heavy & dense, long lasting Monster sized Elk Antler Chew! Designed to keep occupied the Largest Dogs of 80 pounds on up to 200+pounds! Fresh Grade A+ Elk antlers are nearly impossible chip or splinter when they are being chewed unlike processed bones, or other lesser quality antler chews. Your Dog's chewing action grinds the antler down very slowly. Antlers have virtually no odor or residue to get on your carpet or furniture. Antlers will vary in shape, thickness and color so no two antler pieces are alike, chances are your dog will enjoy the variety of these antler chews. With elk antlers there is only 1 Ingredient, our naturally shed antlers are a 100% organic, annually renewable resource containing no artificial or added Hormones, Antibiotics, Animal By-Products, Steroids or Preservatives. Always supervise your dog when giving treats. Discard any small leftover pieces that could possibly be swallowed. Always provide plenty of fresh, clean water. Been trying to find a large elk antler for my bullmastiff this is far larger than I could have imagined this thing is massive. My bullmastiff absolutely loves it.